The Red Cross admits that Red Magen David promised not to officially serve residents in Judea and Samaria. The Red Cross admitted Wednesday that Magen David Adom [Red Magen David] emergency services promised not to officially serve residents in Judea and Samaria and instead to have regional councils officially administer rescue efforts. 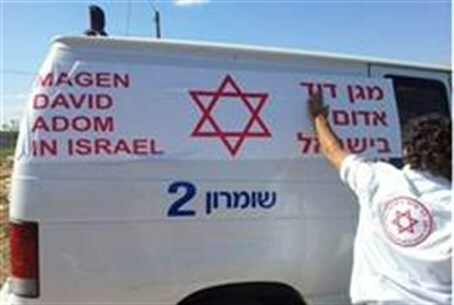 Magen David Adom (MDA) also agreed to removed its Jewish symbol from ambulances, as Arutz Sheva previously reported, Red Cross official Par Stanback told Army Radio, following weeks of contradictory statements that tried to mask the agreement. When Arutz Sheva first exposed the entire story, the MDA head claimed it was inaccurate, but Arutz Sheva then posted the entire agreement it had obtained and to which MDA was a signator. MDA had signed a document that on its part abrogated the right to serve any areas not recognized internationally as within Israel's borders.That excluded large population centers such as Kiryat Arba, Efrat, Maaleh Adumim, Ariel, Kedumim and parts of Jerusalem as well as all the smaller Jewish communities in Judea and Samaria. Many contributors have stopped donating to MDA since the agreement was disclosed. Yesha youth, a considerable percentage of the volunteer force, stopped volunteering for MDA in protest. He called on people to stop donating to MDA and instead donate blood directly to hospital blood banks and channel funds to other rescue services or to regional councils that administer the rescue services in Judea and Samaria. “All of these actions by MDA are a surrender to the demands of the Arab Red Crescent and a condition for Magen David Adom to be an official member of the Red Cross,” MK Eldad wrote, a month before the Red Cross admission. Magen David Adom officials have explained that the level of service in Judea and Samaria continues as it was and that the agreement was made because it raises the status of the group as an official member of the International Red Cross. Its membership allows it to participate in worldwide rescue efforts and to receive funds from the organization, according to the MDA. However, Dayan, chairman of the Council of Jewish Communities in Judea and Samaria said the agreement only gives senior Magen David official an “entrance card” into the Red Cross.